Happy New Year everyone! I hope you all had fabulous holidays! After two shows in early fall, I spent the rest of the year with patients: Raggedy Anns and teddy bears and more bunnies than you can count! I’m starting to think stuffed bunnies replicate like warm blooded ones! The hospital is still full, but patients aren’t doubling up in the beds anymore, and the average length of a stay is back to a couple of weeks (3 weeks with the spa). The hospital has been so consistent, that I’ve had trouble finding time to restock my original dolls, let alone create new designs. And I have some great new design ideas, including a Sherlock Holmes doll! A court just ruled that Sherlock Holmes is officially in public domain, so he’s fair game for a doll now. So… I may be dropping a few art shows and sticking with the web for the dolls. 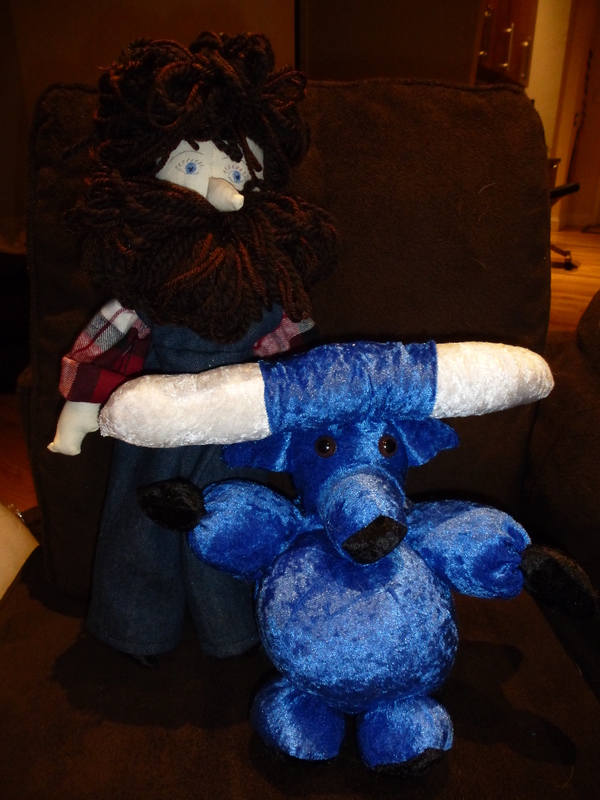 You can always order them through the site (two Babe the Blue Ox dolls went home to start the year!) and I’m hoping to start listing individual dolls on Etsy in a few months, so stay tuned for updates here and on the hospital blog, which I update every week or so…. In the meantime, here are the Babe and Paul non-reversible dolls who went home for New Years….